“My name is Sadikalar”, said my new guide. 35 years old, Sadikalar looked a great deal older. He’d spent the last ten years in the Afghan National Police. I didn't pry about whether or not he’d fought. But I assumed he probably had. 14 months before I arrived in Ishkashim, the town did come under attack - at least according to news sources. In May 2017, the Taliban launched an offensive on the district surrounding the town. Apparently, they briefly came to control Ishakshim itself, according to news reports. Cognizant of this recent history, I asked Sadikalar what happened while we walked from the border to his car, where we’d begin our short tour of his district. Sadikalar denied the attack had happened at all. Perhaps sensing my unease, he reassured me once more: “No no, Ishkashim is very very safe. You don’t need to worry”. I suddenly became worried that his dismissal of the old man’s warnings was inspired by a need to get tourist dollars into the district rather than a genuine security assessment. This basic question clouded my visit. About 3 kilometres walk from the border lay Sadikalar’s house - a simple but spacious single-story mud brick building surrounded by tall walls. He opened a garage to reveal his car - a late 90’s Carolla with novelty California number plates. “I have a similar car in Australia”, I said [well, my girlfriend does]. He seemed unimpressed. Soon, we were driving towards the centre of Ishkashim. It was on the short car trip that he offered me to stay with his family for the night. I was eager to say yes, and we agreed on a price - $100 for a night’s accommodation, food, a tour of the district, and for him to serve as a translator. Ishkashim is known for its ludicrous prices due to its economic suffocation wrought by the Taliban. In that climate, 100 bucks seemed reasonable. And I was happy to deposit a generous sum of US dollars into such a depressed economy. It would at least make my trip a touch more beneficial than Tomas’. What is striking about Ishakshim is its natural setting - utterly out of sync with what comes to mind when you think of Afghanistan. A truly beautiful mosaic of fields, livestock, streams and mountains is ever-present. There is a lot of activity in the farms, mainly manual labor, which gives the place a sense of old-world energy - until you look closer. “Why are there so many kids in the fields?”, I asked. “This is Afghanistan”, Sadikalar replied. Among Afghanistan’s many challenges is the prevalence of child-labor. Here, it didn’t appear coerced and could be interpreted by some as some romantic homage - a wholesome taste of what life on the family farm used to be. But it was early afternoon on a weekday. It was sad to see children who should be getting educated manually ploughing fields and herding livestock. Adult women appeared to join them - some pregnant, all shrouded head-to-toe. The men, meanwhile, milled about in the bazaar, which we soon arrived at. Ishakshim’s surrounds are serene, but its main bazaar is a depressing little outpost. Dozens of half-shipping containers form shop-fronts on the side of a dirt road. All sell watermelons and soft drinks. Fewer sell fresh meats or other non-edible consumer goods. Prices are also, apparently astronomical. The main roads that connect Ishkashim to the rest of Afghanistan are all occupied by Taliban. It means getting non-essential items to town is ridiculously onerous and expensive. It makes the town largely self-sufficient, and void of luxury goods. The few soft drinks, Nokia 3310s, sim cards, electronics, and clothes that make it in are significantly more expensive than elsewhere, according to Sadikalar, despite the extent of local poverty. As Sadikalar shopped, I took photos and exchanged smiles and greetings with locals. My first thought while strolling the bazaar was that this WAS Afghanistan. It wasn’t at all similar to Eshkashim in Tajikistan. Here, every scene looked like the Afghanistan you see on TV. Few women were in public - those who were remained clad in full faced burqas. Many men wore traditional Afghan dress, though few sported beards in this comparably moderate corner of the country. Most striking was the amount of weaponry on display. Police are everywhere in Ishkashim. Literally every few meters. Some walk the streets in traditional clothes with AK-47s in their hands or draped across their back. Others are uniformed. Some ride in the back of pick-up trucks with large, mounted machine guns at their disposal. The police and military nearly outnumber locals going about their business. Sadikalar told me that over 700 military and police are stationed in Ishakshim, a township with a population of only a few thousand. On those numbers, police and soldiers would make up more than 20 per cent of the local population. The vast majority of locals were overtly welcoming. They’d look at me, smile, and say ‘salom melekom’ (this corner of Afghanistan speaks Persian, not Pashto) with hand-on-heart. Some others looked at me with vacant, discomfiting stares. I assumed none were threatening, like I assume of anyone in any place. One man spoke perfect English. His name was Idi Mohammed. I learned that, in addition to running a small shop selling cigarettes, bottled drinks and dried noodles, he was the region’s only English teacher. He was the man who’d taught the local border guards such perfect English. We chatted for 15 minutes. I asked about the security situation, and tourism in the region. Again, I pressed about the attack that happened last year. “There was no attack here”, Idi said. “It was a few kilometres away from here, but not in Ishkashim”. He then offered that familiar refrain: “It is very safe here. You have nothing to worry about”. I was confused. Unless credible news sources were entirely inaccurate, there was an attack on Ishkashim in May 2017. I felt like the locals were just reluctant to say it was so. Perhaps it was a minor incursion that was reported out of context. But their denials seemed strange to me considering the local military commander had given a press conference to foreign reporters spruiking his success in driving the militants out of town. Maybe they were unaware of the foreign media’s coverage of the attack. Maybe the attack didn’t really occur - or was at least so insignificant compared to other attacks that locals weren’t perturbed. In any case, it highlighted the challenges of ascertaining accurate information in a region clouded by war and the constant threat of violence. I asked Idi about the state of tourism. On this question, he seemed to allude to the attack. “We used to have more tourists 3 or 4 years ago”, he said. I asked why there are fewer now. “I think people are scared, because of what happened last year. And because less people are coming, the guest houses are closing down”. Idi implicitly admitted to the 2017 incursion. But again, he stressed the safety of the region, and made one final argument in favour of his homeland. “Afghanistan is a wonderful place every day of the year. It is only when they attack that it is a bad place”. 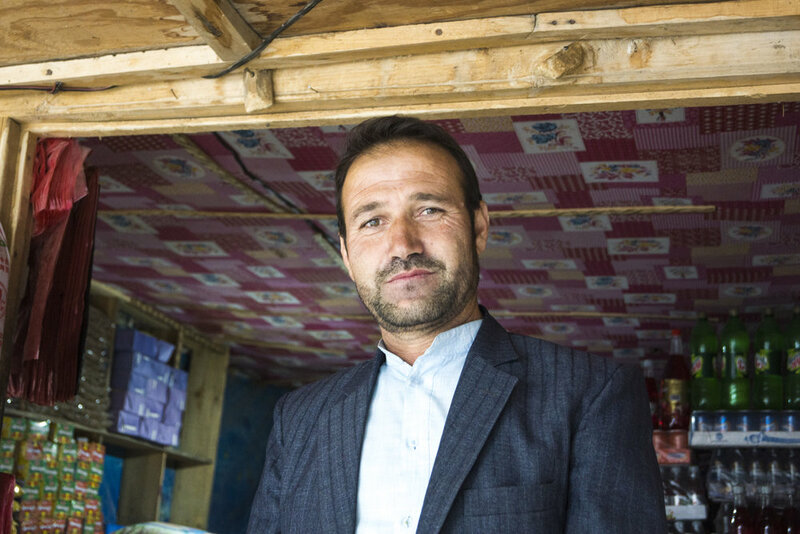 Idi Muhammed, a local shop-keep and Ishkashim's resident English teacher. He has been teaching all of the border guards English in an attempt to broaden their ability to welcome tourists to the region. Back in the Corolla, we drove south of town. Sadikalar wanted to show me more of the region, but was driving out of the secure zone and south towards Zebak - which is currently controlled by the Taliban, and is only 20 kilometres from Ishkashim. I became uneasy, particularly when he pointed at a nearby hill - not some soaring, snow capped peak, just a pathetic, easily-climbable hill - and said “the Taliban are just 6 kilometres away. Just over that mountain”. I made it clear we’d driven as far south as I felt necessary. He laughed and did a u-turn. We were to spent the night at his house, but first, we visited the in-laws. It was a bone-rattling drive from central Ishkashim to a nearby village, about 5 kilometres from the bazaar and close to the border. We parked and opened a large gate, entering a beautifully kept garden, which served as the veggie-patch of Sadikalar’s mother-in-law, Ruboda. My first glimpse of Ruboda was memorable. There stood a remarkably strong woman. Her grandchildren lined up behind her, as if she was their protector. She stood tall, was draped in a purple shroud and welcomed me with a tired smile. She looked to me like some sort of hero - an almost mythical sage from the pages of history; a warrior, which I suppose she was. She invited me into her home for tea. I slipped off my worn-out boots and stepped in. Houses in this part of Afghanistan adopt a typical Pamiri structure. There is a large open area where guests eat, sleep, and gather for discussions. Beautiful rugs and tapestries cover every surface. Sadikalar and I entered, followed by some other hangers-on whom I couldn't quite place in the family structure. We drank green tea and broke bread. Without prompting, Ruboda spoke to me through Sadikalar’s translation. Ruboda, one of the most stoic individuals I've ever met. I felt this portrait captured the strength she eminated - but also opened a window into her hardship. “We lost both my husband and my son to the Taliban”, she said, utterly out of context with my basic conversation starters such as “you have a beautiful home” and “the tea is delicious”. I apologised for her loss with no real understanding of what she must have endured, which I’m sure was obvious. Ruboda’s son and husband had been police officers, like Sadikalar. They hadn’t died in Ishkashim, but elsewhere in past fighting. Ishakishim is known as perhaps the safest part of Afghanistan. It struck me that, even here - in the safest corner of the country - the impact of the Taliban is tangible and ever-present. At Ruboda’s, we sat in silence. It wasn’t akward. But it was quiet. Soon, Sadikalar suggested we leave for his place. I thanked Ruboda and took her portrait, which I felt captured every ounce of her strength. Sadikalar dropped off some food. This appeared a daily ritual - him checking in on his mother-in-law. Perhaps Sadikalar was the only man in Ruboda’s life that was left. I’m not sure. But their relationship appeared closer than that of typical in-laws. Her presence left a mark on me. Her weathered, sad face - her ability to only muster a half smile - personified the horrors of 40 years of war.